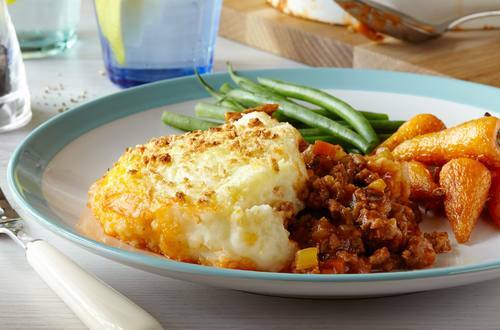 This great Shepherd's Pie recipe is bursting with flavors with the creamy mashed potato complemented by the great taste of Hellmann's® or Best Foods® Real Mayonnaise. 2 Brown ground lamb in large skillet over medium-high heat, stirring occasionally. Stir in onion, celery, carrot and garlic and cook, stirring occasionally, until vegetables are tender, about 10 minutes. 3 Cover potatoes with water in 2-quart saucepot; bring to a boil over medium-high heat. Reduce heat and simmer 15 minutes or until potatoes are tender; drain. Return potatoes to saucepot, then add Hellmann's® or Best Foods® Real Mayonnaise and milk. Mash potatoes until smooth and creamy. Season, if desired, with ground black pepper and set aside. 4 Stir flour into lamb mixture and cook over medium heat, stirring frequently, 2 minutes. Stir in tomato paste, water and Knorr® Homestyle Stock – Beef and bring to a boil over high heat. Reduce heat and simmer gently, stirring occasionally, 20 minutes or until mixture thickens. 5 Spoon lamb mixture into 2-quart shallow oven-proof casserole, then top with mashed potatoes. Broil until lightly golden, about 1 minute. Sprinkle with parsley.